Tycho Brahe (December 14, 1546 Ð October 24, 1601), was a Danish (Scanian) nobleman astronomer as well as an astrologer and alchemist. He was granted an estate on the island of Hven and the funding to build the Uraniborg, an early research institute, where he built large astronomical instruments and took many careful measurements. As an astronomer, Tycho worked to combine what he saw as the geometrical benefits of the Copernican system with the philosophical benefits of the Ptolemaic system into his own model of the universe, the Tychonic system. From 1600 until his death in 1601, he was assisted by Johannes Kepler, who would later use Tycho's astronomical information to develop his own theories of astronomy. He is universally referred to as "Tycho" rather than by his surname "Brahe", as was common in Scandinavia. He is credited with the most accurate astronomical observations of his time, and the data were used by his assistant Kepler to derive the laws of planetary motion. No one before Tycho had attempted to make so many redundant observations, and the mathematical tools to take advantage of them had not yet been developed. He did what others before him were unable or unwilling to do - to catalogue the planets and stars with enough accuracy so as to determine whether the Ptolemaic or Copernican system was more valid in describing the heavens. On April 19, 1559, Tycho began his studies at the University of Copenhagen. There, following the wishes of his uncle, he studied law but also studied a variety of other subjects and became interested in astronomy. It was, however, the eclipse which occurred on August 21, 1560, particularly the fact that it had been predicted, that so impressed him that he began to make his own studies of astronomy helped by some of the professors. He purchased an ephemeris and books such as Sacrobosco's Tractatus de Sphaera, Apianus's Cosmographia seu descriptio totius orbis and Regiomontanus' De triangulis Omnimodis. Tycho realized that progress in the science of astronomy could be achieved not by occasional haphazard observations, but only by systematic and rigorous observation, night after night, and by using instruments of the highest accuracy obtainable. He was able to improve and enlarge the existing instruments, and construct entirely new ones. Tycho's naked eye measurements of planetary parallax were accurate to the arcminute. His sister, Sophia, assisted Tycho in many of his measurements. These jealously guarded measurements became the possessions of Kepler following his death. Tycho was the last major astronomer to work without the aid of a telescope, soon to be turned toward the sky by Galileo. While a student, Tycho lost part of his nose in a duel with rapiers with Manderup Parsbjerg, a fellow Danish nobleman. This occurred in the Christmas season of 1566, after a fair amount of drinking, while the just turned 20-year-old Tycho was studying at the University of Rostock in Germany. Attending a dance at a professor's house, he quarrelled with Parsbjerg. A subsequent duel (in the dark) resulted in Tycho losing the bridge of his nose. A consequence of this was that Tycho developed an interest in medicine and alchemy. For the rest of his life, he was said to have worn a replacement made of silver and gold blended into a flesh tone, and used an adhesive balm to keep it attached. In 1901, though, Tycho's tomb was reopened and his remains were examined by medical experts. The nasal opening of the skull was rimmed with green, a sign of exposure to copper, not silver or gold. Some historians have speculated that he wore a number of different prosthetics for different occasions, noting that a copper nose would have been more comfortable and less heavy than one of precious metals. Tycho was the preeminent observational astronomer of the pre-telescopic period, and his observations of stellar and planetary positions achieved unparalleled accuracy for their time. For example, Tycho measured Earth's axial tilt as 23 degrees and 31.5 minutes, which he claimed to be more accurate than Copernicus by 3.5 minutes. After his death, his records of the motion of the planet Mars enabled Kepler to discover the laws of planetary motion, which provided powerful support for the Copernican heliocentric theory of the solar system. Tycho himself was not a Copernican, but proposed a system in which the Sun orbited the Earth while the other planets orbited the Sun. His system provided a safe position for astronomers who were dissatisfied with older models but were reluctant to accept the Earth's motion. It gained a considerable following after 1616 when Rome decided officially that the heliocentric model was contrary to both philosophy and Scripture, and could be discussed only as a computational convenience that had no connection to fact. His system also offered a major innovation: while both the geocentric model and the heliocentric model as set forth by Copernicus relied on the idea of transparent rotating crystalline spheres to carry the planets in their orbits, Tycho eliminated the spheres entirely. He was aware that a star observed near the horizon appears with a greater altitude than the real one, due to atmospheric refraction, and he worked out tables for the correction of this source of error.To perform the huge number of products needed to produce much of his astronomical data, Tycho relied heavily on the then-new technique of prosthaphaeresis, an algorithm for approximating products based on trigonometric identities that predated logarithms. On November 11, 1572, Tycho observed (from Herrevad Abbey) a very bright star which unexpectedly appeared in the constellation Cassiopeia, now named SN 1572. Since it had been maintained since antiquity that the world beyond the orbit of the moon, i.e. that of the fixed stars, was eternal and unchangeable (a fundamental axiom of the Aristotelian world view: celestial immutability), other observers held that the phenomenon was something in the Earth's atmosphere. Tycho, however, observed that the parallax of the object did not change from night to night, suggesting that the object was far away. Tycho argued that a nearby object should appear to shift its position with respect to the background. He published a small book, De Stella Nova (1573), thereby coining the term nova for a "new" star (we now know that Tycho's star in Cassiopeia was a supernova 7500 light years from earth, today known as SN 1572). This discovery was decisive for his choice of astronomy as a profession. Tycho was strongly critical of those who dismissed the implications of the astronomical appearance, writing in the preface to De Stella Nova: "O crassa ingenia. O caecos coeli spectatores" ("Oh thick wits. Oh blind watchers of the sky"). Tycho's discovery was the inspiration for Edgar Allan Poe's poem, Al Aaraaf. In 1998, Sky & Telescope magazine published an article by Donald W. Olson, Marilynn S. Olson and Russell L. Doescher arguing, in part, that Tycho's Supernova was also the same "star that's westward from the pole" in Shakespeare's Hamlet. In this depiction of the Tychonic system, the objects on blue orbits (the moon and the sun) rotate around the earth. The objects on orange orbits (Mercury, Venus, Mars, Jupiter, and Saturn) rotate around the sun. Around all is sphere of fixed stars. 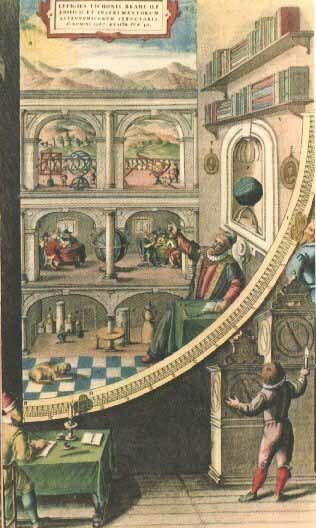 Kepler tried, but was unable, to persuade Tycho to adopt the heliocentric model of the solar system. Tycho believed in a modified geocentric model known as the Tychonic system, for the same reasons that he argued that the supernova of 1572 was not near the Earth. He argued that if the Earth were in motion, then nearby stars should appear to shift their positions with respect to background stars. In fact, this effect of parallax does exist; it could not be observed with the naked eye, or even with the telescopes of the next two hundred years, because even the nearest stars are much more distant than most astronomers of the time believed possible. The Tychonic system is very similar to the Copernican one, except that it has a static earth instead of a static sun. In the years following Galileo's observation of the phases of Venus in 1610, which made the Ptolemaic system intractable, the Tychonic system became the major competitor with Copernicanism, and was adopted by the Catholic Church for many years as its official astronomical conception of the universe. 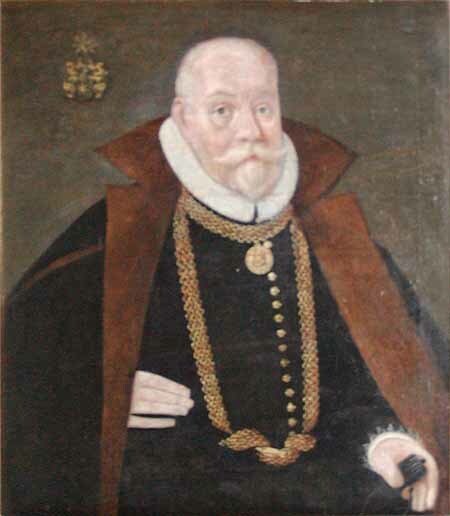 King Frederick II of Denmark and Norway, impressed with Tycho's 1572 observations, financed the construction of two observatories for Tycho on the island of Hven in Oresund. These were Uraniborg and Stjerneborg. Uraniborg also had a laboratory for his alchemical experiments. Because Tycho disagreed with Christian IV, the new king of his country, he left Hven in 1597 and moved to Prague in 1599. Sponsored by Rudolf II, the Holy Roman Emperor, he built a new observatory in a castle in Ben‡tky nad Jizerou, 50 km from Prague, and he worked there for one year. The emperor then had him move back to Prague, where he stayed until his death.In return for their support, Tycho's duties included preparing astrological charts and predictions for his patrons on events such as births, weather forecasting and astrological interpretations of significant astronomical events such as the comet of 1577 and the supernova of 1572. 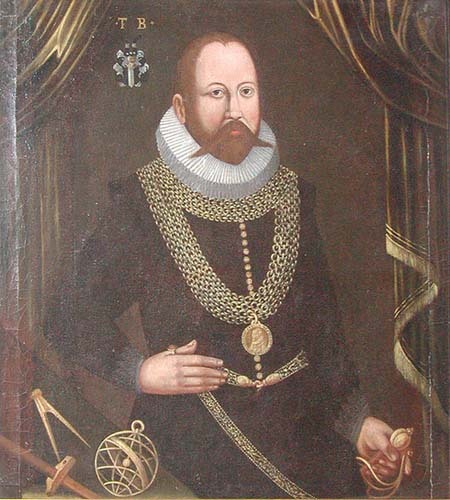 Like the fifteenth century astronomer Regiomontanus, Tycho Brahe appears to have accepted astrological prognostications on the principle that the heavenly bodies undoubtedly influenced (yet did not determine) terrestrial events, but expressed skepticism about the multiplicity of interpretative schemes, and increasingly preferred to work on establishing a sound mathematical astronomy. Two early tracts, one entitled Against Astrologers for Astrology, and one on a new method of dividing the sky into astrological houses, were never published and are unfortunately now lost. 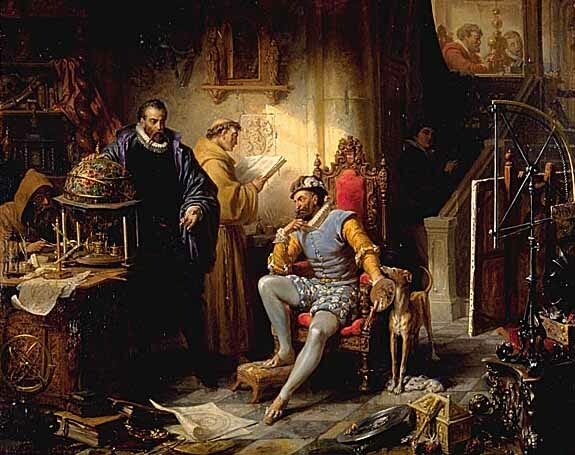 Tycho also worked in the area of weather prediction, produced astrological interpretations of the supernova of 1572 and the comet of 1577, and furnished his patrons Frederick II and Rudolph II with nativities and other predictions (thereby strengthening the ties between patron and client by demonstrating value). An astrological worldview was fundamental to Tycho's entire philosophy of nature. His interest in alchemy, particularly the medical alchemy associated with Paracelsus, was almost as long-standing as his study of astrology and astronomy simultaneously, and Uraniborg was constructed as both observatory and laboratory.In an introductory oration to the course of lectures he gave in Copenhagen in 1574, Tycho defended astrology on the grounds of correspondences between the heavenly bodies, terrestrial substances (metals, stones etc.) and bodily organs (medical astrology). Despiciendo suspicio ("By looking down I see upward") and Suspiciendo despicio ("By looking up I see downward"). As several scholars have now argued, Tycho's commitment to a relationship between macrocosm and microcosm even played a role in his rejection of Copernicanism and his construction of a third world-system.  T y c h o   d i e d   o n   O c t o b e r   2 4 ,   1 6 0 1 ,   s e v e r a l   d a y s   a f t e r   s t r a i n i n g   h i s   b l a d d e r   d u r i n g   a   b a n q u e t .   I t   h a d   b e e n   s a i d   t h a t   t o   l e a v e   t h e   b a n q u e t   b e f o r e   i t   c o n c l u d e d   w o u l d   b e   t h e   h e i g h t   o f   b a d   m a n n e r s ,   a n d   s o   h e   r e m a i n e d .   H i s   b l a d d e r ,   s t r e t c h e d   t o   i t s   l i m i t ,   e x p l o d e d .   H e   d i e d   a f t e r   e l e v e n   a g o n i z i n g   d a y s . T y c h o   B r a h e ' s   b o d y   i s   c u r r e n t l y   i n t e r r e d   i n   a   t o m b   i n   t h e   C h u r c h   o f   O u r   L a d y   i n   f r o n t   o f   Tyn   n e a r   O l d   T o w n   S q u a r e   n e a r   t h e   A s t r o n o m i c a l   C l o c k   i n   P r a g u e .